We do it every year. We decide on one or a few things we’d like to change about our health, appearance, or personality, and as the countdown to the new year starts and the ball begins its descent, we’re excited to start a fresh, new year. The next day, we’re still excited about our New Year resolutions. After a while, however, life gets in the way and our resolutions become non-existent. How do we change that? If you’re like the majority of us, you’ve almost given up making any resolutions at all because they never seem to work out. 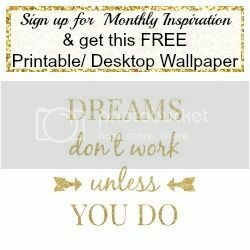 Fortunately, we’ve rounded up clever and unique ways to help you stick to your resolutions by using inspirational home decor. Its easy to come up with resolutions but if you don’t put an actual plan in place on how to achieve them, it just won’t happen. I start with a worksheet to set goals for every area of my life whether it be health, social, family, financial or whatever. Then I start with monthly, weekly and daily calendars to show how I will actually find the time to implement these goals. You can download my free resolution worksheets here. One of the most common reasons people don’t stick to their resolutions is they’re unrealistic. If you’ve never exercised a day in your life, you probably won’t be able to become a competitive weight lifter over night. Set specific, realistic goals for yourself instead of setting yourself up for failure. If your goal is to lose weight, pick a number and go for it. If you’re trying to lose more than a few pounds, break it down into smaller goals throughout the year. The next step is to proudly display your goals where you and everyone can see. This will help to hold you accountable for your goals. If you don’t already have a family command center, you should make one, especially if one of your resolutions is to be more organized. 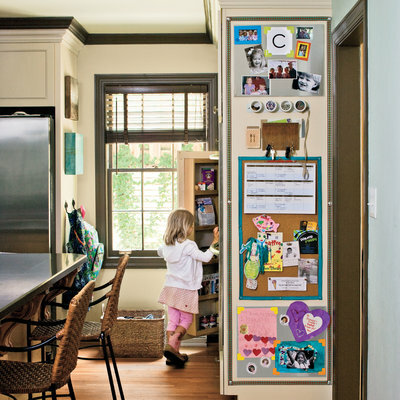 Hang up your resolutions along with the rest of your family’s prominently on your command center. This will help you see the goals every day and be more inclined to complete them. If command centers and lists aren’t your thing, opt for a vision board instead. Be sure to make it a physical vision board that you can hang on your walls rather than an online one. 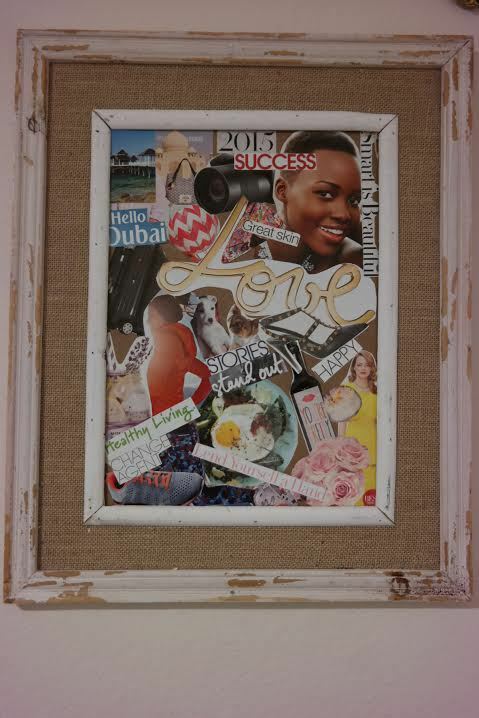 Online vision boards may work for some people, but most people have more luck with a physical one. You can use a cork board, a picture frame, an old mirror, or simply your wall. Start by setting a clear goal. If your resolution is to be nicer and more positive, find images that reflect exactly what you’re looking for – someone smiling, someone handing out food at a food bank, anything that represents what you’re trying to change about yourself. Whether you enjoy his comedy or not, Jerry Seinfeld is a hard worker who writes jokes every day. His secret is the “Don’t break the chain” calendar. You get a giant calendar with the entire year on it and hang it on your wall. If your resolution is to do something every day – such as exercise, eat something healthy, meditate, etc. – this is one of the best things you can do to stick to your resolution. Hang a red marker next to the calendar. 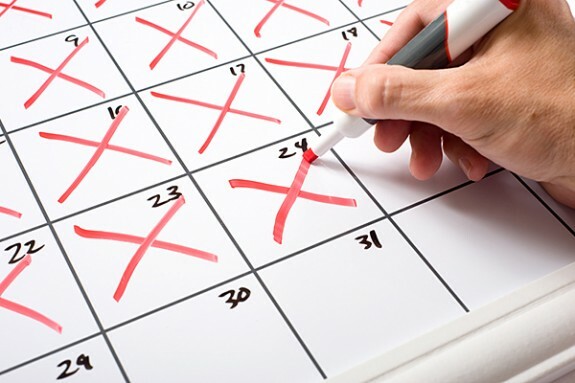 Put a big, red X on the calendar for every day you complete your task. After a few days of doing your task, you have a chain. Now, the secret is to not break the chain. Keep going and see how long you can get your chain. Can you go till the end of the year? It’s more motivating than you’d think!